We’re thrilled to be hosting Code for America’s big hackathon event Saturday, February 25th, at Conjunctured! Code for America is an AMAZING initiative started with the goal of “helping governments work better for everyone with the people and the power of the web.” They’re a non-profit, non-partisan, non-political 501(c)(3) organization that is bringing together tech communities and local governments across the nation to bring about innovative problem solving. From the KXAN article: “Last year, Code for America developers in Boston helped create an app that let parents track school bus routes in real time. The app not only provided information to parents, it also helped free up city staff who routinely handle a large number of calls about delayed school buses during winter weather events in Boston.” How cool is that?! I’m excited to see what the Austin folks come up with! If you have an idea for an event you’d like to host at the Conjunctured house, we’d be happy to have you! Check out our event booking page for information. On our 2 year anniversary party RSVP Eventbrite invitation we asked generous party attendees to contribute money to East Austin Schools. We are thrilled to have raised $85 via this casual request for donations. To top it off some, Conjunctured is going to pitch in an additional $25 to the cause. What is the cause exactly? Mr. K.’s mathematics class at “Austin Can! Academy” a school for at-risk students, located 5 minutes away from Conjunctured, needs color and black ink cartridges for their classroom printouts. We’ve donated the $110 in donations we raised from the party and want you to take this project on home. If you have not already donated or would like to donate more, please go to Donors Choose right now and donate a small amount of money to this cause. If money is tight, please use their social media links on the page to promote the cause. Thanks again to everyone who came out to celebrate our 2 year anniversary and very special thanks to everyone who donated! Howdy there and happy 2010! Hope the year is going well for you so far! As for Conjunctured, we’ve come a long way since our opening in 2008. And we owe it all to the supportive tech, entrepreneur, and social media community here in Austin. That, and we’ve worked pretty dang hard to keep things chugging along! Thanks to everyone for not only believing in coworking, but also believing in us too! In an effort to provide a bit of a recap over the back half of 2009, here’s the lowdown of some recent Conjunctured happenings. Launched “Conjunctured Specialists,” a seal of approval for certain experts in their field. A number of people regularly emailed us asking for connects to web designers, programmers, and creatives in our community of members. Now we have an official place to direct them to. So, if you or someone you know needs some freelance work done, please consider choosing a Specialist we recommend. Traded in our loving coffee robot, Rosie, and replaced her with French presses, a commercial quality espresso machine, and a variety of weekly freshly roasted coffee beans from local roaster, Casa Brasil, thus making many of us at Conjunctured higher on the coffee snob spectrum than ever before! Hosted two successful Conjunctured Poker Nights. Thanks to Jason Stoddard for helping lead this initiative! Awarded Austin Chronicle “Best of” award. (“Best High Tech Co op“). This was at the end of 2008, but still something cool to mention! Received 8 five star reviews on our Conjunctured Yelp profile! If you would like to review us too, please do! Assisted in pro-bono Austin AIDSWalk social media consulting. Stay on top of upcoming Conjunctured happenings by following us on Twitter and becoming our fan on Facebook. In the meantime, if you haven’t dropped by Conjunctured lately, please do! We’ve changed the artwork on the walls, rearranged furniture a bit, have more people than ever constantly buzzing around, the coffee is always amazingly fresh, and there’s always a positive and productive energy. That, plus: you’re pretty much always guaranteed to learn something new and not only meet someone new, but someone as driven and passionate about what they do as you are! How many places can promise that? Swizzle, the startup advertising agency founded by Stefani Zellmer along with her husband Chris Davis, is looking forward to continuing their “Switcheroo” campaign for Velocity Credit Union with a microsite that strives to turn one of their billboard headlines, “Bank Schmank,” into everyday vernacular. See this campaign and others on their website at Swizzleme.com. In 2009, Dusty Reagan’s Twitter application development company Floating Head Studios, released Featured Users an ad network that allows Twitter users to sponsor their favorite Twitter applications in order to gain exposure for their personal and professional Twitter accounts. Floating Head Studios also upgraded key back-end features to their flagship product Friend Or Follow, which has seen a 16x increase in Web traffic January 2009. In 2010 Dusty will be celebrating the release of his first published book, “Twitter Application Development For Dummies.” Available for pre-order at Amazon here: http://bit.ly/61S0W2. Along with the book’s launch, Floating Head Studios will be releasing the book’s accompanying example Twitter app, Twooshes. Also in time for the book launch and SXSWi 2010 will be the newest version of Friend Or Follow, which includes a paid pro version. We are looking forward to an exciting year. We ended 2009 with the launch of the new Barton Place condominium website, BartonPlaceAustin.com, and have begun working on 3 new local sites set to launch in mid February. Our Houston-area news site, OnlyKaty.com, has experienced phenomenal traffic growth during the last six months, and continues to prove the power of consistent blogging on your traffic. In 2010, Myles LLC is looking for Austin businesses interested in more than just pretty design. We want businesses interested in integrating compelling stories into their online (and offline) campaigns. Businesses that understand that the media is not the message, and consistency is key. If you match, call Carson Coots at 832-755-1312. Aldea works with independent Guatemalan weavers, connecting them to conscious consumers through the woven goods they make. By combining contemporary fashion with traditional Mayan weaving techniques, we’ve been able to gain new key customers this year. This year we’ve proudly been selling our scarves through Whole Foods Market and specialty boutiques around the country. We’ve also started working with university bookstores around the country, creating custom scarves to fit individual colleges. We’ve struck recent success here in our hometown of Austin as we’ve built a key relationship with the University of Texas. Our 2010 focus will be on the university market. Starting in January, we’ll be preparing for the Campus Market Expo tradeshow to be held this March in Orlando. Our hope is that we’ll leave Orlando with new clients, some national PR and suntans. Cesar spent lots of 2009 blogging on his blog and tweeting. He plans to do more of this in 2010 and hopes to finally put a down payment on a jetpack. This is the future, after all. SEOintelligence has had a busy and exciting 2009, and we’re about to share the juiciest fruits we’re harvesting from the year’s labors. SEOintelligence will formally launch version 2.0 of our search toolset in January 2010. This new version represents a fundamental step forward from all of the earlier eleases, bringing better management of core search related-data (keywords and competitors) and a host of new tools to monitor your sites across not only Google, Bing, and Yahoo, but rankings engines like Compete, Alexa and Technorati as well. We look forward to sharing SEOintelligence 2.0 with all of you early in the New Year, and wish everyone a wonderful holiday season and prosperous 2010. Renovatix signed on with Sidedoor Studio in April of 2009 to completely overhaul their branding on the web. Their business has been given a fresh new look on both the web and with their sales and marketing materials. The team at Renovatix Solutions are experts in their field; our goal was to position them visually in their market so they can focus on what they do best. In May of 2009, Sidedoor Studio teamed up with Steve and Lee Nagel to create a website highlighting the Swing Fore! Yellow Charity Golf Classic at Gleneagles Country Club in Plano, Texas. The charity benefits the Lance Armstrong Foundation. Sidedoor was honored to donate and design the site for such a wonderful cause. Continuing their efforts for 2010 Sidedoor Studio is currently rebranding the law firm of Van Wey Law who was recently featured on the Dan Rather Reports Tonight. Their new site will be launching mid January. At turn2live.com, we’ve been busy building out the back-end for the nationwide release of version 3.0. We’re stoked about the incredible difference you’ll see when we go live with the new site. In fact, in Spring of 2010 we’ll help you find ALL the live-event that match your mood. Feeling Quirky + Energetic? Texas Rollerderby. Sunny + Mellow? Ray LaMontagne at the Hollywood Bowl. Whether it’s a romantic date night you seek or a day packed with energy and intensity, Turn2Live will help you navigate through and package together the most relevant dining, live-music, sports, theatre and movie options available to you right now. 2009 was an interesting year for me, as I made an attempt to shed freelance clients in lieu of creating my own infrastructure and product. For the majority of 2009, I worked with a team of engineers in Southern California and Shenzhen, China developing a soft case line of products for the Nintendo Wii, DS, DSi and Sony PSPgo and am still in development on a line of premium controllers for the Wii, Playstation 3 and XBOX360. These products are being branded under the premium label, CM4, Inc. The entire process has been really interesting and an amazing learning experience, taking an idea sketched on paper 10 months ago to a physical product on store shelves, today. I’m excited to watch this project grow in 2010 and hope to utilize much of the talent oozing from the Conjunctured walls. Someone should probably take a sponge to that. A fun, spontaneous evening with your sweetie is just a phone call away thanks to a new Austin business. If you’re too busy to plan a night out, or have simply run out of date ideas, SparkNight is your answer. They’ll create an entire evening from start to finish – dinner reservations, event tickets and more – so you can sit back and enjoy a romantic night with your partner. The company was launched in Des Moines, Iowa as part of Startup Weekend 2009. They’ve recently moved to Austin and their first happy couple enjoyed a date just a few weeks ago. For more information, or to surprise your special someone with a romantic evening out, contact Shelly at shelly@sparknight.com or (515) 834-0167. 302designs, an earth-friendly & poetic apparel design company, experienced an exciting year of growth! We expanded our organic t-shirt product selection to include eco-friendly hoodies as well as supersoft organic cotton longsleeves and v-neck shirts for men and women. We’ve grown our online business steadily as well as our outreach to boutiques across the nation. In October, we launched a new line of business, custom apparel printing for local businesses and organizations, with a radio campaign on Austin’s popular KGSR radio station. (Was great to have Conjunctured members, Dave Winter and Carson Coots, volunteer their voice talent for the radio spot!) 2010 will be a year of extending our distribution through hiring a national sales force of reps.
One of my favorite accomplishments of 2009 was learning to make Espresso at Conjunctured from Dave Walker. In 2010 I hope we get a freezer so I can make iced americanos. Cheers to an amazing 2010! @mashable SummerMash Austin a huge success! It seems like so long ago, but I just wanted to say how much fun we had at Mashable’s SummerMash Austin last week.It was great to hang with Pete Cashmore and Karen Hartline, Yoono, MySites and Houston’s own Erica O’Grady; we’re glad we got to show them that Austin doesn’t just party hard during SXSW.The best of the best were out at Buffalo Billiards and it only served as a taste of things to come in March.You can read Karen’s review of the night on the Mashable site. Mark “Rizzn” Hopkins, associate editor at Mashable, even dropped by from Dallas to check out what he calls the “burgeoning Web 2.0 community” in Austin.Make sure to read his post-event reflections on the Mashable site, as well as watch the included videos.He underlines what local groups like Conjunctured, Austin Startup and Austin 3.0 have been discussing for the past few months—there’s something happening with the Austin technology community.I know I usually find myself caught up in a bubble regarding the future of Austin tech, so it’s great to hear the same thing from people outside of our small, yet ever-evolving community. Thanks so much to everyone who wore a Conjunctured sticker that night and special congratulations to the winners of the Part Time passes we raffled as part of our event sponsorship.See you soon guys! Make sure to check out The Creative Space‘s Michael Cummings‘ absolutely awesome photos from the event. Conjunctured gets an east side history lesson. Note: This post was originally written in 2008. 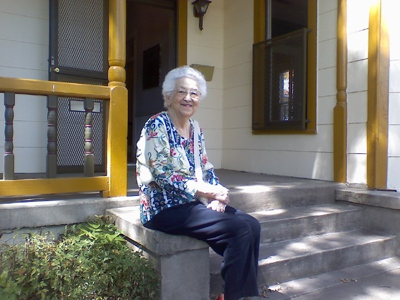 On Jan 2, 2010 Ms. Cisneros passed away in Austin. May she rest in peace. When we were featured in Omar Gallaga‘s Statesman article last Sunday on coworking along with LaunchPad Coworking and Caroline Collective, we had no idea of the interest we would garner from the Life & Arts feature.Notes of encouragement and requests for more information on coworking came from all over the Austin community.Many thanks to all those who have written in or talked to us in person—it’s great to see that Austin is more than ready for coworking. One special note dropped in our email the Monday following the article from a family who was convinced they knew the house shown in the paper.They claimed it was the house their Aunt Alice lived in decades ago.Even though the article never explicitly stated our address, the family easily called out our address as 1309 E. 7th St.We quickly invited the Cisneros over and by Thursday had Aunt Alice walking through the halls and rooms of the Conjunctured house, taking us back to Austin more than 50 years ago. We learned lots of history about the house, including the stories when the family first purchased an air conditioner to wine-making and fermenting under the house (we’ve yet to explore down there, but if we’re lucky we’ll come across some leftover vintage homemade wine). It’s interesting to note that when Alice was living in the house as a teenager, it actually was a two-family house, complete with two kitchens.We’re glad we gained a first-hand account of the history of the house and that we get to continue the tradition of commingling people within the four walls of the space.Even though Austin is a young city, it’s growing exponentially day by day and we’re thrilled to be a part of the growth and that we can share in part of the history of the E. 7th St. house.